Product #20723 | SKU 8001 7720 | 0.0 (no ratings yet) Thanks for your rating! 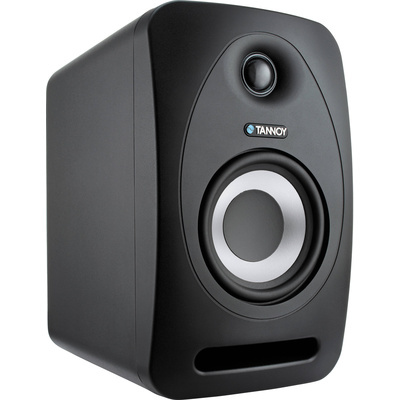 The Reveal 802 from Tannoy is an 200 mm powered 2-way reference speaker that is designed for mixing and monitoring at home or in the studio. It features an active crossover filter that aims to improve timing for a wider sweet spot, plus an accurately-tuned, front-firing bass port to help ensure optimal low-frequency performance. Equipped with a bi-amped, 140W amplifier that powers an 200 mm woofer and a 25 mm soft-dome tweeter, the Reveal 802 is designed to ensure maximum power, tonal clarity, and low-frequency response. It also features adjustable volume and AEQ settings to customise the tuning of the speaker to compensate for acoustical deficiencies that may be present in your monitoring environment. Included in the box of each monitor, is a 5-metre 1/8" (3.5mm) jack cable. Combined with the AUX Link feature, this allows you to plug into your laptop or portable music player's headphone output and link two Reveal 802 monitors for an instant stereo setup with no need for external interfaces. This is convenient for mixing on-the-go or for times when you just want to listen to some of your favourite music from your mobile device.